Hubby is in the kitchen! 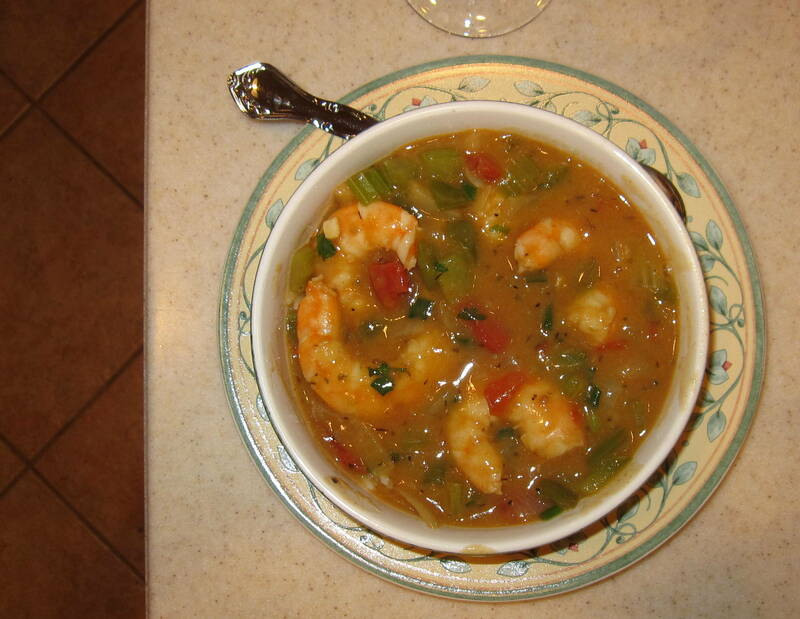 Hubby made Garrett Weber-Gale’s Shrimp Etouffee (Garrett’s recipe below) and WOW! This is so good! This Shrimp Etouffee is good!!!! Melt butter in a medium to large size pot. Create a roux by mixing the butter and flour thoroughly so that there are no clumps. Your roux will be used for thickening and for creating a smoky/nutty flavor. Keep stirring. 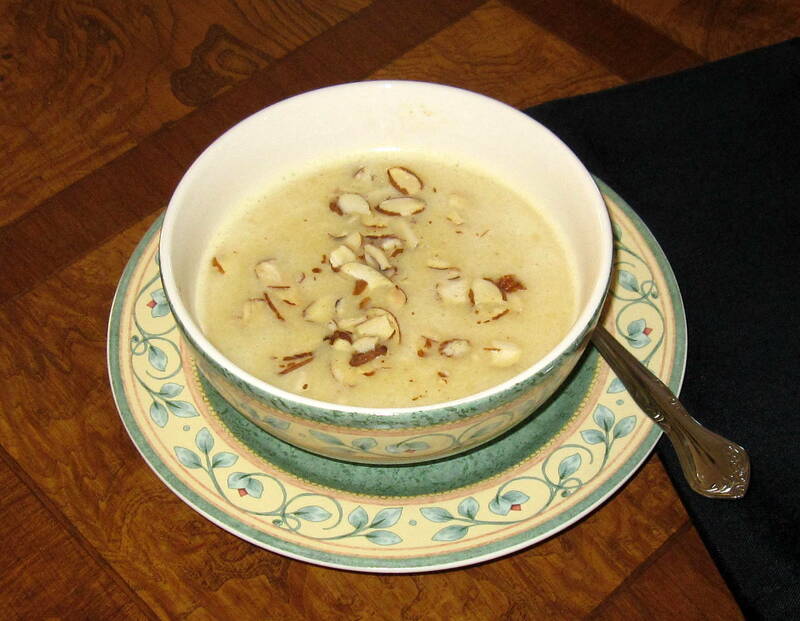 A darker roux is often used for gumbos. 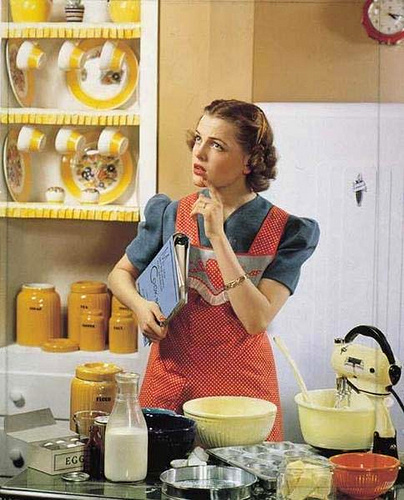 I use a roux that is between the color of the yellow butter and the darkness of peanut butter. This step may take anywhere from 10 minutes to as many as 20. Next, chop and add the celery, onion, and green pepper. Cook these until they have become soft. Add one tablespoon of my Kickin’ Spice. Add minced garlic. Notice the great aroma as you then add tomatoes. Mix all ingredients and bring to soft boil and simmer. Add two cups of chicken stock. Once this has come to temperature (easy boil), add the shrimp and one more tablespoon of Kickin’ Spice. Once the shrimp have started to turn pink and curl, add the chopped parsley and chopped green onion. Simmer on low for ten minutes. Now serve this delicious southern favorite with Brown Rice. Enjoy!!! I do love to cook (when I don’t have a slew of projects I’m trying to complete). There is satisfaction in being in the kitchen and preparing new (and some tried and true ‘old’) dishes. It gives me pleasure – and when the dishes turn out to be very good (which a surprising number do) – it gives DH pleasure also! I love eggplant . . .
Slice 6 half-inch rounds from the widest part of each eggplant (12 total); reserve. Cut the skin off the remaining pieces of eggplant and cut into a small dice; reserve. In a hot sauté pan, with a few drips of olive oil, cook the eggplant slices, with a pinch of salt, for about 3 minutes per side to soften. Work in batches and when done place them on paper towels to cool. The paper will absorb the excess juice drawn out by the salt (these juices can be bitter). While the eggplant slices are cooling, add the ricotta, Parmesan, Jack cheese to a bowl. Season with salt and pepper to taste, and stir to combine. Spoon the cheese mixture on to 6 of the eggplant slices, dividing evenly. Press the other 6 eggplant slices on top to sandwich the cheese in between; reserve. Add 2 tablespoons of olive oil to the saute pan, and over medium heat, add the garlic and cook until it begins to sizzle (do not brown). Add the diced eggplant and cook, stirring, for 5 minutes. Add the water, tomato sauce, and pepper flakes; cook on low for 15 minutes. Season with salt and pepper to taste. Pour half the sauce mixture on the bottom of a small casserole dish. 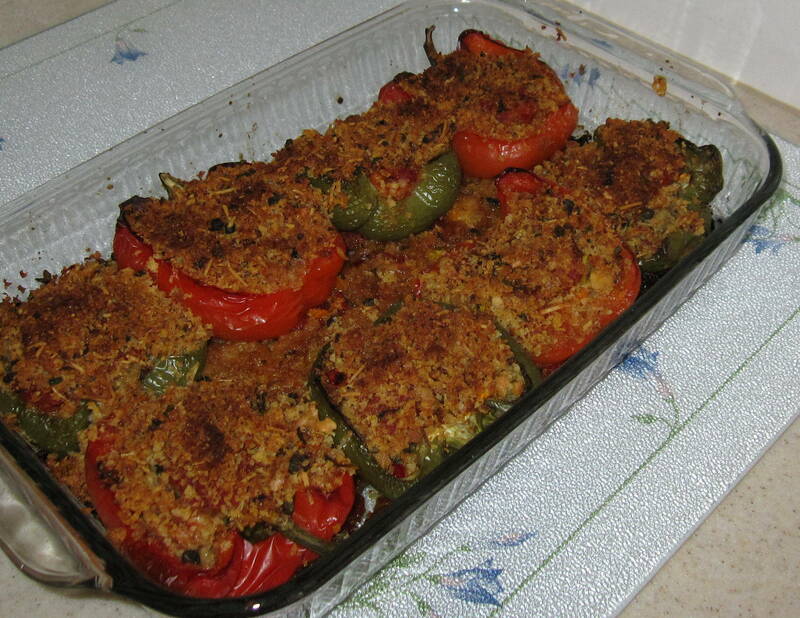 Place the 6 cheese-filled eggplant slices on the sauce, and pour over the rest of the sauce. Spread evenly so all the eggplant is covered. 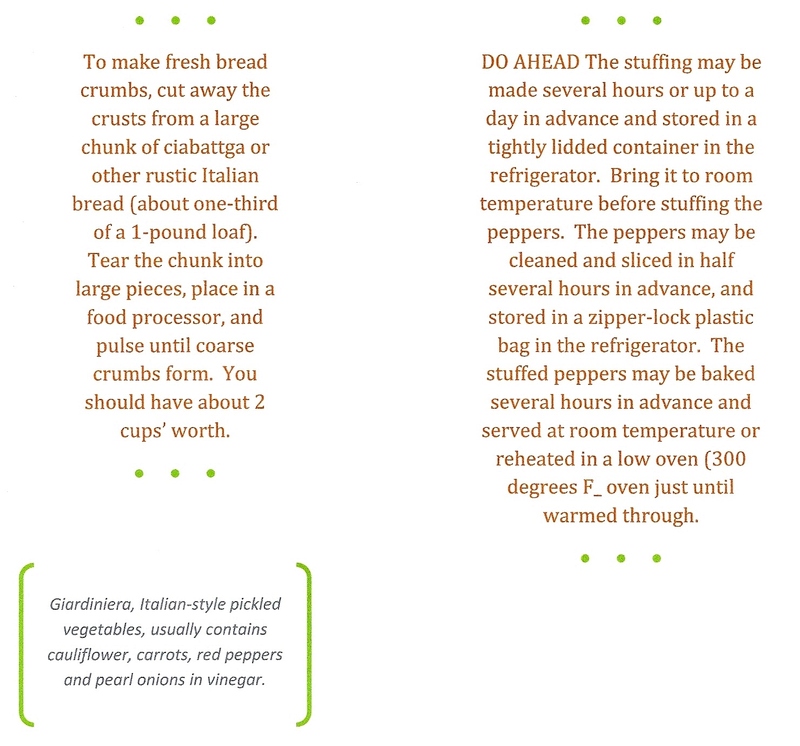 In a small bowl mix the breadcrumbs, 1/2 cup of Parmesan, and 2 tablespoon of olive oil. Spread over the eggplant. 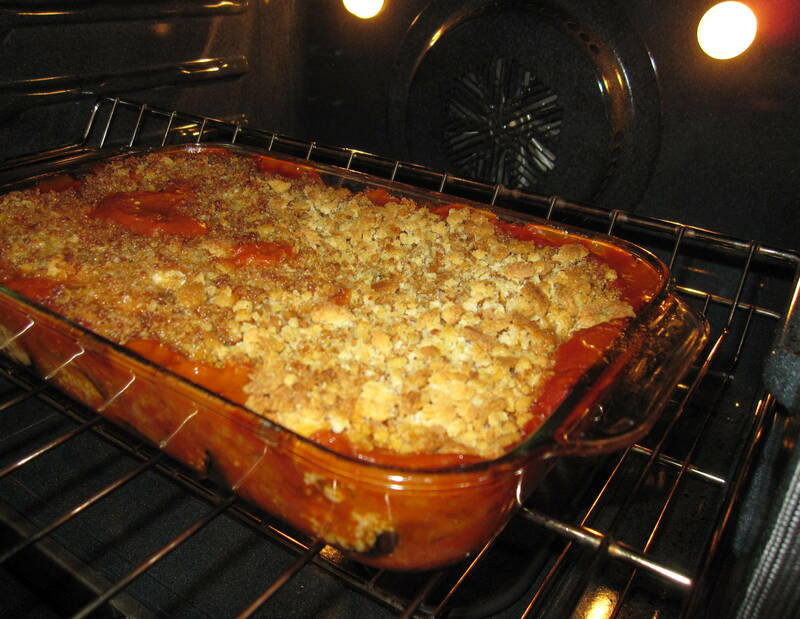 Bake in a preheated 375 degrees F. for 40 minutes, or until the casserole is bubbling and the top is browned and crisp. Let sit for 10 minutes before serving. 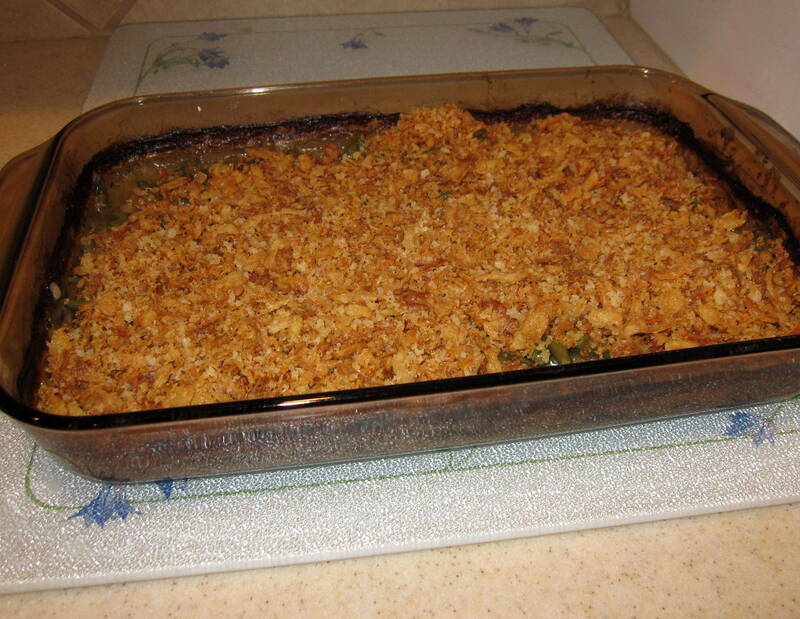 This casserole is oh-so-very DELICIOUS! If I make these ramekin cakes again, I will make a sauce to drizzle over the inverted cakes that are on plates. I just think a sweet sauce will be a welcome addition – although we really liked this dessert! No yellow peppers at H-E-B – substituted green! Preheat oven to 450°F. Toss butternut squash, olive oil, rosemary, and crushed red pepper on large rimmed baking sheet. Sprinkle with salt. Roast for 15 minutes. Remove squash from oven and flip them around a bit before popping back into the oven for another 15 minutes or so. You are looking for the squash to begin browning and to become nice and tender. While the squash is baking, whisk the orange juice, lemon juice, and oil together. Season with some salt and pepper and set aside. When you are ready to assemble the salad, combine the lettuce, pomegranate seeds, and walnuts and lightly toss in the dressing. Spoon warm or room temperature squash over the top of the salad and sprinkle with feta cheese. Enjoy!! We really did like this salad! We really liked the butternut squash; however it would have been less trouble to use Mandarin oranges and the salad would have been just as good. Melt in a heavy-bottomed soup pot until beginning to brown. Add and saute until onions are translucent but not brown. Add and bring to a simmer. Cook until parsnips are soft, 40 minutes. Add and remove from heat. Pour into blender and puree until velvety smooth. Stir in. Serve garnished with 3/4 cup / 175 ml toasted pine nuts or other nuts. 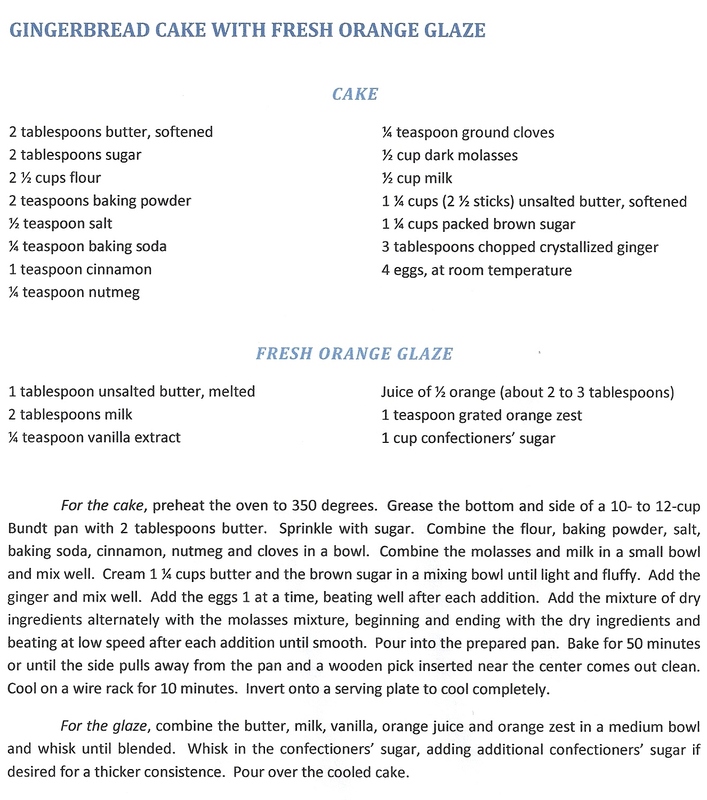 Thanks to cousin Chris Smith for sharing this recipe. boo hoo! I dropped the pan on the cake when I was lifting it . . . BEANS – While the sauce cooks, toss the beans and cornstarch well. Transfer to a 9×13 ceramic baking dish. Pour hot mushroom sauce over top. Gently press beans into the sauce so that all the beans are submerged. Cool completely. Cover with plastic wrap, making sure there’s no air between the beans and the plastic. Wrap with foil. Freeze. Do not thaw before baking. TOPPING – No more than a day before, mix the panko, butter, salt and pepper in a skillet. On medium heat, let the crumbs brown, stirring often, being careful not to burn. Stir in the fried onions. 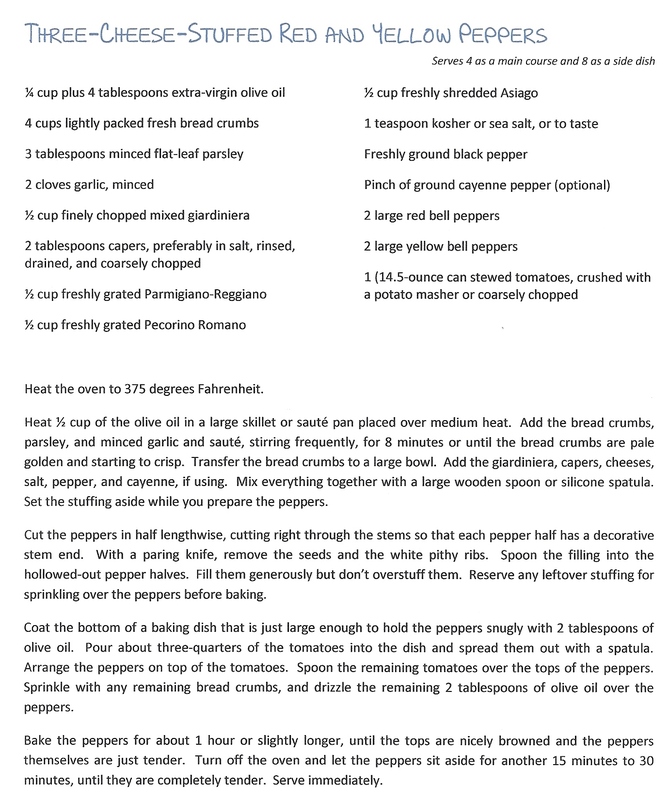 BAKING – Preheat oven to 400F. IMPORTANT: remove plastic wrap from casserole, then replace the foil. Bake for 30 minutes, stir, leave the foil off and bake for another 50 minutes. (If the sauce is too thin, leave in oven, stirring every 5 minutes or so, until it thickens.) Spread topping over the casserole, bake for another 10 minutes until golden. Cook potatoes in boiling water to cover in a saucepan 30 minutes or until tender; drain and mash. 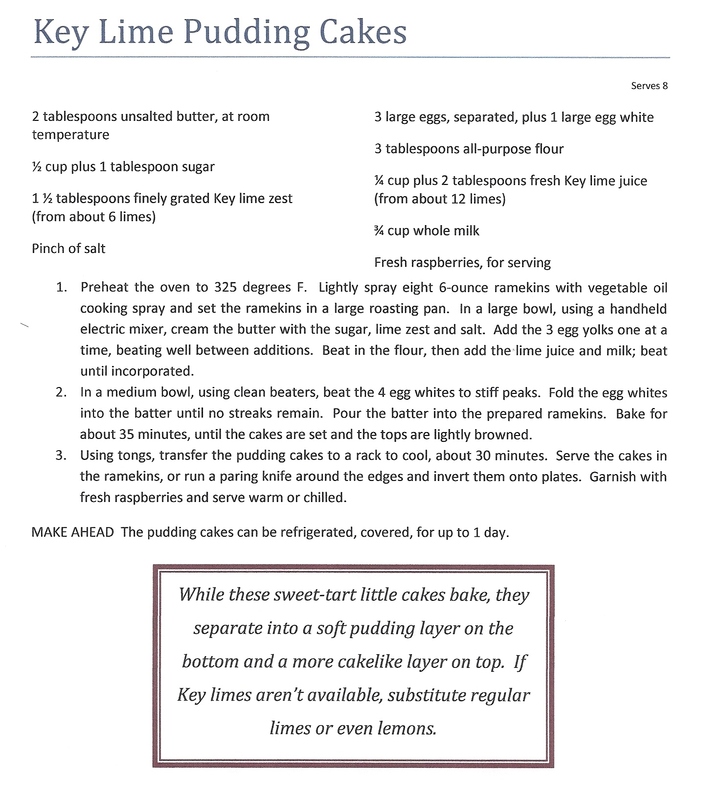 Beat cream cheese at medium speed with an electric mixer until smooth; add potatoes, sour cream, and next 4 ingredients. Beat just until blended. Spoon mixture into a lightly buttered, 2-quart baking dish. Sprinkle with paprika. Cover and chill overnight. Remove from refrigerator and let stand at room temperature 15 minutes. Bake, uncovered, at 350 degrees F. for 30 minutes, or until bubbly.